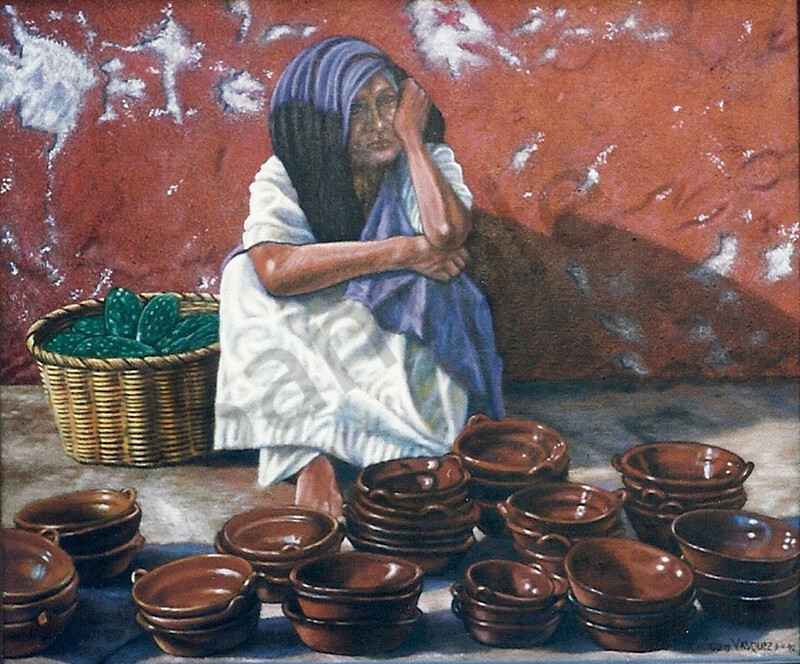 This compelling piece presents an indigenous Indian woman selling pottery and nopales out of a basket. The painting’s details can mentally send the viewer to any outdoor market with a hustle of crowds and the wonderful smells of outdoor cooking. This Limited Edition Giclee is 20 x 24, its original size. There are only 120 high quality canvas prints available including a Certificate of Authenticity. This compelling piece presents an indigenous Indian woman selling pottery and nopales out of a basket. The painting’s details can mentally send the viewer to any outdoor market with a hustle of crowds and the wonderful smells of outdoor cooking. This Limited Edition Giclee is 20 x 24, its original size. There are only 120 high quality canvas prints available including a Certificate of Authenticity. The price is exclusive of any tax, shipping, or frame.